Well, we’ve cracked the top 20 and things are heating up, literally. Temperatures are rising on the docks in 1954’s On The Waterfront, a film that reminds one how amazing movies and acting can be. I don’t even know where to start with this film, so I’ll just jump right in. The story is intense, focusing on a washed up boxer (Terry Malloy played by Marlon Brando) who works on the docks and runs errands for a mobster union boss. When he becomes the central figure in a mob hit and falls for the sister of the dead stool pigeon his life gets turned upside down and he’s torn between staying D&D (deaf and dumb) or singing like a canary (talking to the cops). Throw in a priest with the passion to make things right on the docks and you get the age-old right versus wrong debate. Nearly 30 years later Robert De Niro used the same lines while winning an Oscar himself for playing Jake LaMotta in Raging Bull, which for the record is No. 4 on the AFI list. But back to On The Waterfront. It took home eight Oscars including Best Picture, Best Director for Elia Kazan and Best Supporting Actress for newcomer Eva Marie Saint. Kazan’s direction was marvelous and along with Leonard Bernstein’s Oscar-winning score provided the perfect mood for the big city docks. Karl Malden was terrific as the priest, who acts as the moral compass for the film and makes the comparison between the sacrifice of the “stool pigeon” and the sacrifice of Jesus. His speeches to the dock workers were also worthy of his Oscar nomination for Best Supporting Actor. 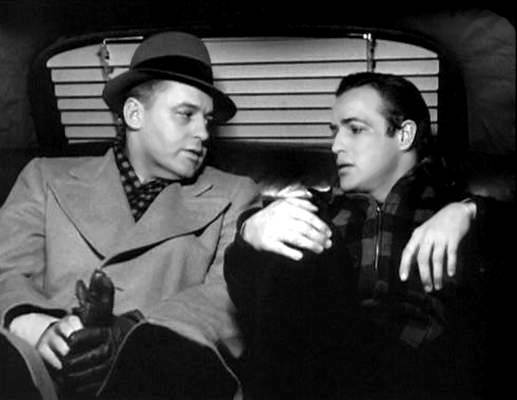 When you think of film in the 1950s On The Waterfront rises to the surface as a masterpiece. Four of the top 20 AFI films are from the 1950s, but On The Waterfront really encompasses the style of the decade. Bernstein’s score has a lot to do with it, but also Kazan’s direction and Brando’s method make the film edgy and alive. But make no mistake — this film as all Brando. And if you don’t like it then I’d be happy to give you a one-way ticket to palooka-ville!